Woody Allen needs no introduction to the cinema world. His vast career of films as both writer, director, actor and so on, have been hits, misses, but always unique and interesting. Woody Allen was and is a director that always knows what he wants in a film and how he wants to go about the final touches to finish the film. This like many of Allen’s films has a wonderful cast of actors and actresses. Woody Allen has a style that only he can do and get away with in film. He has a natural talent of creating truly original pieces of cinema. His ultimate completion of films is something that stands out as being one of a kind experiences. What can be said new or different, that has not already been said about Woody Allen and his ultimate genius of film making. Even in the past reviews I have done for other Twilight Time Blu-ray releases of this master genius of film, I have had a hard time coming up with new stuff to say. Woody Allen is just one of those unique, mastery, gifted and iconic performers, directors and writers that are, few in number. Twilight Time has lovingly released many of Allen’s films, with new transfer’s in high definition. Twilight Time creates wonderful outlets to films, and this is another flawless transfer product and an example of how to treat a film. You can read my reviews for them on my other posts under the Twilight Time label on my page. You either love or hate Woody Allen movies. Most of Allen’s films are simple, down to earth and nothing grand, just great interaction of performing. That performing holds the watcher and creates a satisfied experience, no matter how simplistic it is. This film I am reviewing has all the trademarks that you would see in a Woody Allen film. One can battle amongst themselves, specifically movie buffs, cinema nerds, film gurus, on just what is the best Woody Allen film. He has done so many films that stand out. Yes, some are misses and some are just plain, must see cinema. 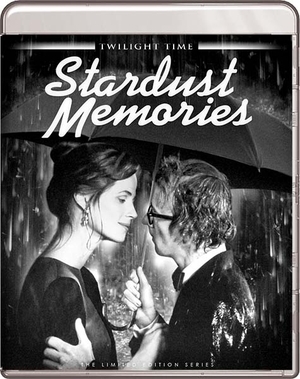 I feel Stardust Memories is a prime example of a wonderful must see film. One of Allen’s best. Also, starring an actress, I fell in love with growing up, the amazing one of a kind Jessica Harper. She plays the character of Daisy in Stardust Memories. Jessica Harper, another magical performer who has graced cinema in many of the wonderful films of cult status. From the one of a kind and amazing, twisted and weird and brilliant Brain De Palma’s Phantom of Paradise, to the iconic horror masterpiece 1977’s Dario Argento’s Suspiria, to the weird squeal to The Rocky Horror Picture Show, Shock Treatment. She also is in one of my ultimate guilty pleasures of cinema, the very funny, forgotten and comical mastery, 1989’s Big Man on Campus ----lord I wish someone would release Big Man on Campus on Blu-ray or DVD----. She also acted in another Woody Allen film, Love and Death which has been released also on a Twilight Time Special Edition Blu-ray. I feel she is another one of those performers that never got the chance to shine on screen. She is a wonderful performer that deserves and deserved so much more. She is a golden goddess of cinema that just makes one smile watching her perform. Also, starring the amazing Tony Roberts. Daniel Stern also stars in Stardust Memories and is also another performer that has been around and explored many styles of characters and personas in film, who can forget Home Alone. I must bring up Breaking Away is Stern's very first acting role and has also been released as a Special Edition Blu-ray by Twilight Time. Stern is a great and gifted actor that I feel never got the limelight he deserved. This also stars the beautiful and amazing Charlotte Rampling as the character Dorrie. Rampling is an amazing actress that is stunning in anything she has ever done. Certain movies might be less than worthy, but her performances are always flawless. She starred in one of my top 50 films of all time 1974’s The Night Porter. She is a lovely woman that knows how to create emotionally charged performances that leave nothing to the imagination, because she becomes that character, breaths for that character, and the part of Dorrie in Stardust Memories is no different. She has been honored with another Twilight Time Special Edition Blu-ray release of her wild and crazy film, Zardoz. Also on an interesting note keep an eye out for actress Sharon Stone’s first film debut in a feature film. Stardust memories is a comical drama written and directed by Woody Allen. It is about a film maker named Sandy Bates who ends up recalling his many loves and films throughout his career while being a part of a retrospect of his successful career. It’s a struggle of an emotional ride while he has conflicts with three women in his life. Attraction to, two different women Daisy and Isobel. He also recalls many memories of his past girlfriend Dorrie. Another fantastic job in High Definition wonder. A beautiful amazing transfer. Fantastic Black and White quality. Crisp in imagery and the sound is fantastic to hear. Twilight Time tends to always express the amazing beauty of what can be done in picking older films and bringing them out on high quality products. Isolated Score Track: Music is done by the fantastic Jazz Heaven Orchestra. Consisting of musicians Hank Jones, Richie Pratt, Arvell Shaw, Earl Shendell, Joe Wilder, Roy B. Yokelson. Joe Wilder was a fantastic Jazz Trumpeter and composer. Sadly, he is no longer with us. He was in 2006 awarded Jazz Master’s Hall of Fame Award. He also in 2008 was honored with NEA Jazz Masters Award. Hank Jones was many realities in the music world, arranger of music, composer and pianist. Sadly, he is no longer with us. He too has been honored with many awards including the NE Jazz Masters award. On an interesting note about him he played the piano for Marilyn Monroe while she sang Happy Birthday Mr. President to John F. Kennedy in 1962. Richie Pratt was a wonderful Jazz Drummer, that sadly is no longer with us. He left a vast career of amazing music. Arvell Shaw was an amazing double-bassist who sadly is no longer with us, but he to left an amazing career of music. He is best known for his work with the great and wonderful one of a kind Louis Armstrong. This was a wonderful music reality to this great film. The tunes stand out and create a fantastic listen. A great extra. I consider this one of Woody Allen’s better films. It has often been talked about amongst film lovers in that, some hate it and others love it. I think this is one of those films that the eye of the beholder must make their minds up in viewing it if it’s one of his best, or worst, or are you stuck in-between. I feel this is a great film, and worthy to praise as one of Allen’s best films. Twilight Time did a wonderful job in picking a great film for a Special Edition Blu-ray. I highly recommend this Blu-ray product, and I highly recommend this film. It’s wonderful seeing this movie on a Blu-ray and lovingly transferred to a high-quality imagery.